A Cairo appeal court on Monday extended the detention of ousted Egyptian president Mohamed Morsi for a further 30 days on charges of escaping from jail and espionage during the 2011 uprising. Morsi, who faces a separate trial for inciting violence, is accused of collaborating with Palestinian Islamist group Hamas to orchestrate his escape from Wadi Al-Natroun prison during the uprising that toppled Hosni Mubarak, destroying police records and killing security personnel. 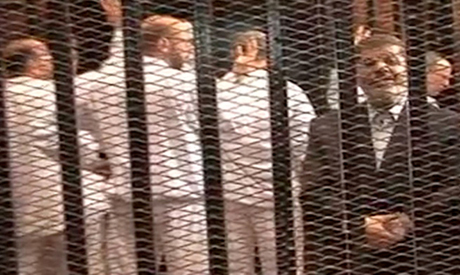 The judge also extended the detention of three other Brotherhood leaders, Sobhi Saleh, Hamdy Hassan and Saad El-Husseini, by 15 days in the same case. Some 11,000 detainees escaped from the prison, northwest of the capital, and thirteen people died during the breakout on 28 January 2011, the fiercest day of the 18-day popular revolt. Morsi had been held incommunicado by the army since his ouster on 3 July, but he was sent to a heavily guarded prison near the Mediterranean city of Alexandria on 4 November, when the first hearing of his trial for incitement to murder took place. His trial was adjourned to 8 January. Yes, this is the only way CC & and its liberal,leftist,felools loyals can prevent themselves from humiliation in hands of Islamists in next elections.Killing,torturing,arresting,baning,terrorising and convicting them on silly and funny charges with the courtsey of Our "Respected unbaised Judiciary" is only way to keep them away from elections. His unfinished prison term, and adding years for breaking out as a fugative. Quiet telling the Muslim brotherhood can only come up with an ex- convict as it's representative. Johny boy. You're great. You make my days always, when I read your exhaustive, comprehensive, cultured and broad articles on our life and understanding of the world, not forgetting your unique mastering of the English language. Please keep up the good work, enlight us with your poetry. And don't forget to come back with the name of John, as I said before, we love you with that name. Just ask sissy if he's decided how many years he wants to sentence them too and pass it along to the "judges" if you can call them that.